Two years ago, I posted about Beverly Cooper who was convicted of multiple counts of fraud and was facing up to a ten-year sentence in Federal Prison. See Press Release. She admitted to signing visit notes when unlicensed personnel made the visits giving the impression that she made the visits; among other things – lots of other things. Signing off on a visit that was made by someone without a license could have easily proved deadly to a patient. Maybe Ms. Cooper is lucky that she didn’t kill someone. Today, I received a message from someone, apparently a friend of Ms. Cooper’s pointing out that nowhere in the indictment (or my blog post) was Ms. Cooper’s 15-hour work days or dying relative noted. The writer asked if I knew how wonderful Beverly Cooper was and pointed out that everybody makes mistakes. Frankly, it would not surprise me if Ms. Cooper was a good hearted, likable woman. Unlike less sophisticated crime, fraud on this scale is usually committed by people who are genuinely likable. The writer of the message mentioned other people involved in the indictment. She wanted to know why I didn’t mention them as well. Frankly, they were not included in the press release. Furthermore, Ms. Cooper was a Registered Nurse. This blog is all about nursing and nurses and those who occupy our worlds. That’s why Ms. Cooper made the blog post list. I don’t know the person who wrote me the email and I never have met Ms. Cooper before. I was nowhere near Detroit where all of this took place. I cannot begin to speculate on what might have happened. But, I can make reasonable assumptions based upon the criminal cases I have worked with and some former clients. Cooper was likely tired and emotionally fragile based upon what the writer said. Masterminds of fraud are incredibly smooth at exploiting the weaknesses of others. She likely was not the mastermind. My bet is that Ms. Cooper was paid far more than an RN in a similar position. Should someone offer you twice as much as you are making now, be aware. You are not worth that much. Cooper may have convinced herself or have been convinced that ‘everyone does it’. Wrongo. There may be somebody in the mix who could be legitimately diagnosed as a sociopath. Being without a conscience is mission critical to projecting the confidence required to persuade accomplices to achieve your purposes. I would bet the farm that at some point long before her arrest, Cooper figured out that she was committing fraud and had to make a decision. It could have been loyalty to her employer, a need for money, fear of extortion or just greed that convinced her to stay. Sometimes, folks are too overwhelmed to think about a major life change. If this case was even remotely similar to other cases, the agency was investigated for years prior to an arrest. Beverly Cooper and her co-conspirators may have become complacent since there was so much time between the investigation and the arrest. Let me reiterate that I do not know anything about these people. They are not the usual fraudsters in Louisiana where we have enough home grown fraud that I don’t have to go looking in places like Detroit. I have met many others who have faced a similar circumstance; enough to make assumptions. I have enjoyed their company and worked hard for them and their lawyers and I took their money for my services. But, when a clear pattern of fraud exists, there is nothing that I can do. Criminal attorneys are brought to their knees trying to find a defense for their clients when there is none. These are not thuggish criminals. They are well dressed, well spoken professionals who say and do all the right things. Your task if you are reading this is to know what a compliant agency looks like so you can find one to work with or create one to attract the kind of talent that you need to bring your agency to the next level. Makes a lot of mistakes – it may seem like even more because they talk about mistakes, bring them out in the open and find ways to avoid repeat mistakes. Has a lot of information scattered around the office about a code of conduct, employee hotlines and compliance committees. Welcomes questions as a door for teaching. Makes sure that employees have an anonymous way to report fraud. Takes reports of fraud offered in good faith seriously. Provides far more education in fraud than anyone wants. Looks at processes and doesn’t blame employees for mistakes that involve multiple people and departments. There’s plenty of time to blame others if it happens again. Fix it and move on. Mistakes are costly to be sure but not nearly so much as hiding mistakes. If you inadvertently make a mistake that affects billing and are fired after reporting it, smile on your way out of the door. You don’t want to be there. The agency has just sent a message to everyone else that they have a zero tolerance policy for mistakes and future mistakes will be hidden away. Ms. Cooper may have been caught up in a storm she could not escape. She may have discounted her actions as inconsequential or have been convinced she would never be caught. She has lost her family, her marriage and her job according to the person who emailed me today. She is completely without dignity. On top of all of that, she is facing jail time. I can’t help but feel compassion for her but more importantly, I am bound and determined to give all of you who take the time out of your day to read my blog the information you need to avoid a similar fate. Unemployment is not half as bad as jail. In today’s lively discussion we will discuss the subtle differences between periods of time referred to as episodes and drive home the reason it matters. It’s that time again. Most patients who were admitted or recertified to home healthcare this month and for the next several months will have some part of their care delivered after October 1. This is really important to note because any patient who is discharged or transferred to an inpatient facility on or after October 1 will receive some part of their care in the ‘Influenza Vaccine Data Period’. The specific questions about vaccines can be found in the OASIS transfer and discharge assessments beginning with M1041. M1041 is a trick question. It asks if any part of the ‘episode of care’ include any dates on or between October 1 and March 31. Most veteran home health nurses understand that an episode of care is quite different from an episode which is a 60 day period of time. Newer nurses and therapists may not pick up on the nuances differentiating an Episode of Care from a generic 60 day episode. An Episode of Care begins at admission OR Resumption of Care and ends at the time of Transfer or Discharge. Got that? As such, an Episode of Care can be equal to a 60 day episode but it could also be longer or shorter than a plan episode. Let’s take a look, shall we? In the illustrations below, the grey arrows represent generic 60 day episodes. The white boxes will show various events that might occur creating an Episode of Care that is different from a plain episode. In the next example, an Episode of Care equals two regular episodes. The last example shows how multiple Episodes of Care can occur within one episode. The white squares are one episode of care while the black squares represent the second Episode of Care. 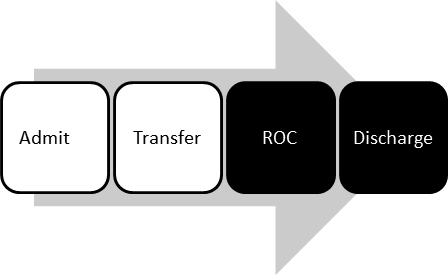 Since the actual questions are not asked until transfer or discharge, the challenge is to make the information readily available for the clinician who completes the transfer or discharge OASIS. It is also your challenge if you perform transfers and discharge assessments to make sure you have the information available. Many agencies have outcomes posted on Home Health Compare indicating that you really don’t care if your patients get the flu. Or worse – you really want the patient’s to get flu. Value Based purchasing will likely include information about vaccines. ‘Value Based Purchasing’ means agencies with good numbers will make more money and that money will come from poorly performing agencies. If that doesn’t alarm you, break it down. Do you really want to fund an increase in revenue to your largest competitor who knows how to distinguish between Episodes of Care and generic 60 day episodes? The flu kills a whole lot of people every year and our elderly are the most vulnerable. While there is concern about the validity of the published numbers, nobody doubts that the flu can take a senior citizen with heart failure out of the game permanently. In 2013, the CDC reports that over 50,000 people died from the flu but last year the number was likely under 5,000. The flu varies wildly and waiting to see how bad it will be does not work. Most assessment tools in computer software or handwritten, include questions about vaccinations on admission and resumption of care. The problem is getting the information right. The checkboxes are not completely trustworthy without dates. So, M1041 researches patients on service from Oct. 1 through March 31. It isn’t until M1046 which strangely directly follows M1041 with no mention of 1042, etc. that the clinician is asked if the patient had a flu shot. There are 8 possible responses. No; patient did not receive the vaccine due to reasons other than those listed in Responses 4 – 7. 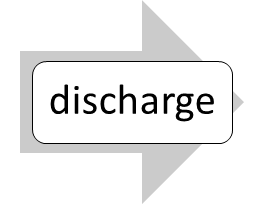 Going back to the second diagram showing how one Episode of Care can go on through discharge over multiple episodes, it is easy to see how the correct response might be hard to find. If you’re really not fond of your coworkers, imagine that it could be you out there doing the discharge and having to click through 200 or so screens to find where a nurse offered the vaccine. The information reported on Home Health Compare reflects only the number of patients who have received the flu vaccine. If they received it from you during another Episode of care, their physician or any other provider, they obviously go into the mix. What does not get counted are the patients who have been offered and declined the vaccine. Your numbers should be very close to 75 percent on home health compare. If they are not, there is a really good chance somebody does not understand the differences between an Episode of Care and a 60 day episode. There it is. Three pages, three unskilled illustrations and almost 100 words so your clinicians will be able to correctly assess whether or not your patients have been vaccinated against the flu. It shouldn’t be this hard, folks. And guess what? We haven’t even touched on Pneumonia or Shingles. Let’s see what washes out in the final regs, first. A guide for documenting the continuing need for skilled services in home health. We have looked and have been unable to find specific guidance on the new CoPs. There was a phone conference scheduled with NGS that was cancelled and nothing so far from Palmetto GBA. Help us out if you know anything. Meanwhile, some people who are very knowledgeable and well respected in the industry differ from us in how we interpret what ‘estimating how much longer the patient will be on service at the time of recertification’ means. Look for it below in larger bold text. §424.22 Requirements for home health services. Medicare Part A or Part B pays for home health services only if a physician certifies and recertifies the content specified in paragraphs (a)(1) and (b)(2) of this section, as appropriate. (a) Certification—(1) Content of certification. As a condition for payment of home health services under Medicare Part A or Medicare Part B, a physician must certify the patient’s eligibility for the home health benefit, as outlined in sections 1814(a)(2)(C) and 1835(a)(2)(A) of the Act, as follows in paragraphs (a)(1)(i) through (v) of this section. The patient’s medical record, as specified in paragraph (c) of this section, must support the certification of eligibility as outlined in paragraph (a)(1)(i) through (v) of this section. (i) The individual needs or needed intermittent skilled nursing care, or physical therapy or speech-language pathology services as defined in §409.42(c) of this chapter. If a patient’s underlying condition or complication requires a registered nurse to ensure that essential non-skilled care is achieving its purpose, and necessitates a registered nurse be involved in the development, management, and evaluation of a patient’s care plan, the physician will include a brief narrative describing the clinical justification of this need. If the narrative is part of the certification form, then the narrative must be located immediately prior to the physician’s signature. If the narrative exists as an addendum to the certification form, in addition to the physician’s signature on the certification form, the physician must sign immediately following the narrative in the addendum. (ii) Home health services are or were required because the individual is or was confined to the home, as defined in sections 1835(a) and 1814(a) of the Act, except when receiving outpatient services. (iv) The services will be or were furnished while the individual was under the care of a physician who is a doctor of medicine, osteopathy, or podiatric medicine. (v) A face-to-face patient encounter, which is related to the primary reason the patient requires home health services, occurred no more than 90 days prior to the home health start of care date or within 30 days of the start of the home health care and was performed by a physician or allowed non-physician practitioner as defined in paragraph (a)(1)(v)(A) of this section. The certifying physician must also document the date of the encounter as part of the certification. (1) The certifying physician himself or herself. (2) A physician, with privileges, who cared for the patient in an acute or post-acute care facility from which the patient was directly admitted to home health. (3) A nurse practitioner or a clinical nurse specialist (as those terms are defined in section 1861(aa)(5) of the Act) who is working in accordance with State law and in collaboration with the certifying physician or in collaboration with an acute or post-acute care physician with privileges who cared for the patient in the acute or post-acute care facility from which the patient was directly admitted to home health. (4) A certified nurse midwife (as defined in section 1861(gg) of the Act) as authorized by State law, under the supervision of the certifying physician or under the supervision of an acute or post-acute care physician with privileges who cared for the patient in the acute or post-acute care facility from which the patient was directly admitted to home health. (5) A physician assistant (as defined in section 1861(aa)(5) of the Act) under the supervision of the certifying physician or under the supervision of an acute or post-acute care physician with privileges who cared for the patient in the acute or post-acute care facility from which the patient was directly admitted to home health. (B) The face-to-face patient encounter may occur through telehealth, in compliance with section 1834(m) of the Act and subject to the list of payable Medicare telehealth services established by the applicable physician fee schedule regulation. (1) Timing and signature. The certification of need for home health services must be obtained at the time the plan of care is established or as soon thereafter as possible and must be signed and dated by the physician who establishes the plan. (ii) Discharge with goals met and/or no expectation of a return to home health care. (2) Content and basis of recertification. The recertification statement must indicate the continuing need for services and estimate how much longer the services will be required. Need for occupational therapy may be the basis for continuing services that were initiated because the individual needed skilled nursing care or physical therapy or speech therapy. If a patient’s underlying condition or complication requires a registered nurse to ensure that essential non-skilled care is achieving its purpose, and necessitates a registered nurse be involved in the development, management, and evaluation of a patient’s care plan, the physician will include a brief narrative describing the clinical justification of this need. If the narrative is part of the recertification form, then the narrative must be located immediately prior to the physician’s signature. If the narrative exists as an addendum to the recertification form, in addition to the physician’s signature on the recertification form, the physician must sign immediately following the narrative in the addendum. (c) Determining patient eligibility for Medicare home health services. Documentation in the certifying physician’s medical records and/or the acute/post-acute care facility’s medical records (if the patient was directly admitted to home health) shall be used as the basis for certification of home health eligibility. This documentation shall be provided upon request to the home health agency, review entities, and/or CMS. 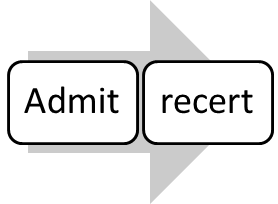 Criteria for patient eligibility are described in paragraphs (a)(1) and (b) of this section. If the documentation used as the basis for the certification of eligibility is not sufficient to demonstrate that the patient is or was eligible to receive services under the Medicare home health benefit, payment will not be rendered for home health services provided. (d) Limitation of the performance of physician certification and plan of care functions. The need for home health services to be provided by an HHA may not be certified or recertified, and a plan of care may not be established and reviewed, by any physician who has a financial relationship as defined in §411.354 of this chapter, with that HHA, unless the physician’s relationship meets one of the exceptions in section 1877 of the Act, which sets forth general exceptions to the referral prohibition related to both ownership/investment and compensation; exceptions to the referral prohibition related to ownership or investment interests; and exceptions to the referral prohibition related to compensation arrangements. (1) If a physician has a financial relationship as defined in §411.354 of this chapter, with an HHA, the physician may not certify or recertify need for home health services provided by that HHA, establish or review a plan of treatment for such services, or conduct the face-to-face encounter required under sections 1814(a)(2)(C) and 1835(a)(2)(A) of the Act unless the financial relationship meets one of the exceptions set forth in §411.355 through §411.357 of this chapter. (2) A Nonphysician practitioner may not perform the face-to-face encounter required under sections 1814(a)(2)(C) and 1835(a)(2)(A) of the Act if such encounter would be prohibited under paragraph (d)(1) if the nonphysician practitioner were a physician. Like most superheroes, it is best to worship him from afar. In fact, I don’t know his name and do not want to because I like a world full of possibilities. My new hero is a physician in Florida and because he remains anonymous, every doctor in Florida could be him. Florida is even sunnier and warmer with all those potential superheroes in white coats. 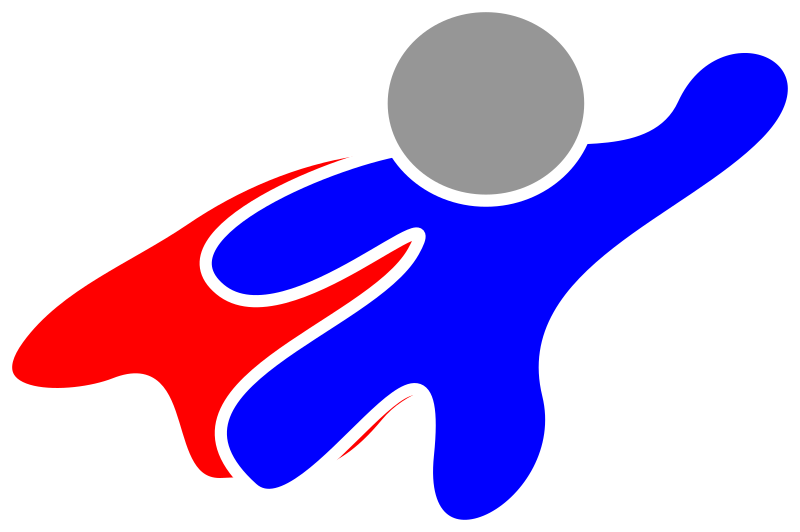 There are some heroic physicians who save lives or invent new procedures. For the longest time, I was leery of the Whipple procedure because I was unaware that it was named after Allen Whipple. I thought the term ‘Whipple’ referred to a technique and I didn’t want to know anything more. Other heroic physicians travel to countries far and wide taking care of patients that have no one else. These docs and other healthcare providers also have my undying admiration. He is. This is a stupid question. Many of you may think that compared to Christian Barnard or Allen Whipple, this isn’t really such a big deal. You could be right but I don’t think so. Meanwhile, home health agencies are being denied daily because the physician does not document how the patients condition confines them to the home. Claims are denied even when patients are recently discharged from the hospital with a serious illness or surgery to replace something like a hip or heart or whatever. When home health care agencies don’t get paid, they are faced with choices that eventually result in providing care that is substandard or closing their doors altogether. That means a poor outcome for the replacement parts. We have all tried, in our own way, to gently hint to Medicare that the F2F encounter document is stupid. NACH has even filed a law suit full of big words spanning numerous pages. Medicare responded that they may relax the requirement in the distant future but no further word has been forthcoming. I suspect they just wanted to minimize the importance of NAHC’s lawsuit. I could be wrong, though. Never let it be said that I am always right. My hero, the unknown physician, has described in five words, why Medicare is getting so little compliance on the F2F matter. Please note that the physician wrote two complete sentences with both verbs and nouns and I hope he gets partial credit for writing a grammatically correct narrative that doesn’t simply restate what is written in the manuals about homebound status. Like most docs our superhero probably saves a few lives here and there and makes other people feel much better about being alive when he isn’t answering stupid questions on a stupid form verifying that he saw a patient he just discharged from the hospital. Luckily for my diligent client, the claim had not been dropped for the patient yet. I hope they make a photo copy of the original document before they go waste another hour of their time and the doctor’s time by once again explaining what an expensive comment that was and asking for a do-over. If this chart is ever summoned by the payor sources, I think I would include the original and the Do-Over. You know, just a subtle little message – because I am all about being subtle. Will everyone please bow their heads and give my hero a moment of silence in honor of his insight into our daily struggles. It is the least we can do for a physician who has contributed so much to so many. Hopefully there are more waiting to come out of hiding.